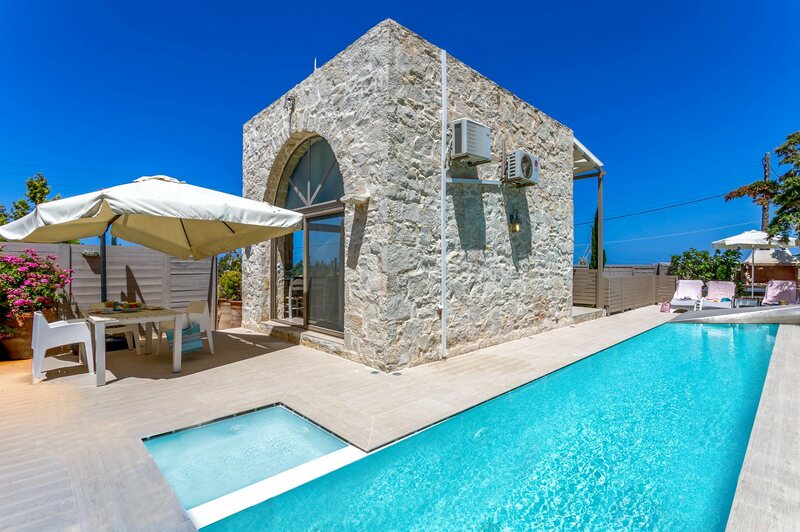 Villa Lefkippos is a chic 1 bedroom house with a hint of traditional furnishings. This beautiful property is full of charm and has a long private pool where you can relax and enjoy this wonderful setting. Located in the area of Gouves, the beach is only a 5 minute walk away, so this villa makes an ideal choice for beach lovers. The resort of Hersonissos is also around 10 minutes by car. WiFi and air conditioning/heating in all the bedrooms, plus lounge are included. Your very own Cretan paradise! With its contemporary furnishings, long private pool and a 5 minute walk to the beach - perfect! The swimming pool is long and narrow, making it ideal for those who like to do lengths. There's Roman steps for easy entry, a water jet for some relaxation and sun loungers dotted around the pool - the perfect place for spending lazy days. There is also a brick BBQ and an outdoor dining area, next to the pool as well as a further shaded table and chairs at the front of the villa - great for alfresco dining! The villa has its own private parking and electric gate. Entrance to the villa is via a few steps and along the side of the house. A sliding door leads straight into the stylish open plan living area. One of the first things that will grab your attention is the beautiful arched windows which create a picture postcard view of the distant sea. There is a flat screen TV, sofa and a glass breakfast bar with chairs. To the back of the room is the compact, white gloss kitchen which reflects the modern character of this room. There are 2 sets of patio doors at opposite ends of this room, leading to 2 separate terraces. The double bedroom is located on the lower ground floor, which is accessed via the external staircase. This bedroom is stylishly furnished to a high standard with solid wood features, attractive exposed stonework and decorated in neutral tones. There's a seating area, dressing table and a flat screen TV with an archway leading to the swish in-room bath and an enclosed WC. The ground floor also has a separate shower room. This villa is registered and licenced by EOT Greek licensing association. This number is: 1039k123K2877101. With local beach being just a 5 minute walk away, Villa Lefkippos is perfect for beach lovers. The property is ideally located for exploring Crete as it is almost in the centre of the long north coast. The national road makes driving easy for those wanting to experience the charms of Crete. There are many places worth visiting much closer by such as Hersonissos and its charming village. Whether it's lazy days round the pool or a day exploring you will be sure to get a taste of the authentic Greek lifestyle. Villa Minos is located next door. The resort of Gouves has all the facilities which you would expect to find for everyday needs. For a wider selection then a trip to Heraklion is in order where you will find shops both small and large. There are some international chains such as Marks and Spencer, Zara, Gap, etc. On Saturday is the main local market which is large. Just about everything can be found here from local cheeses to linens, shoes to kitchen equipment as well as the freshest fruit and vegetables from local producers. There are many restaurants, tavernas, bars and cafes in Gouves. Some are on the beach road and some are more inland. Either way you'll find something to suit all taste. Otherwise venture into nearby Hersonissos for a wider selection, especially in the village, from a cool drink to a Greek Meze, there is something for everyone. The nearest beach to Villa Lefkippos is a mixture of sand and shale and is very unspoilt. The beaches dotted along the beach road of Gouves vary from sandy to pebbly. Some having sunbeds and umbrellas for hire. If you go to Hersonissos or Stalis you will find many beaches that vary in size. Families generally have differing opinions about what they want to do but the great thing about Gouves is there's lots to do within a fairly short radius! Adrenaline junkies? There are 2 water parks close by. Horse riding? There is a stable with a taverna just outside Hersonissos which caters for all levels of experience. The Crete Aquarium is a 15 minute drive away and is run by the Marine Biology faculty of the University of Crete. Crete has it all! Archaeology? Knossos, Phaistos, Malia - all Minoan Palaces of varying importance during the period when the island was inhabited between 3650 to 1400 BC . More recent history can be witnessed at Spinalonga. This is a very small island just a short boat ride from Plaka in the east and is worth a visit. The mountains should not be missed. Crete has a mountainous spine running along its length and the mountains of Lassithi close by also have a verdant plateau which is home to extraordinary numbers of birds of prey and also produce much of the vegetables you find in local shops. The Crete Golf course is an 18-hole course and is located just outside Hersonissos thus making the villa an excellent choice for anyone wishing to play whilst here. Villa Lefkippos is not available to book for season as it is sold out. Take a look here at the Crete villas that are currently on sale. As the name suggests this is a maze where the objective is to find the centre and the Minotaur, then find the escape route!! Its great fun for all the family and the route is changed regularly. It's a 3D maze with steps and bridges too just to make it more interesting! Along the way visitors will learn more about the myths and legends surrounding the famous Minotaur of Knossos. There is also a mini golf and cafe, too for less energetic explorers. Children can also have a go in the pottery workshop where Minoan items are reproduced. An eco-garden with aromatic Cretan herbs, fruit trees and vegetable garden are all cultivated to ecological standards. Aquaplus water park is split into two connected sections,one for adults including the extreme slides and the other beng for children.The slides are set amongst gardens full of cretan trees and exotic flowers.The park offers from 50 slides, games and catering facilities.They use a cashless bracelet scheme and have a system setup to reduce the waiting time for the slides.Sunbeds and umbrellas are included in entry price.